Part of an authentic detached farmhouse, tastefully decorated in a rustic style. 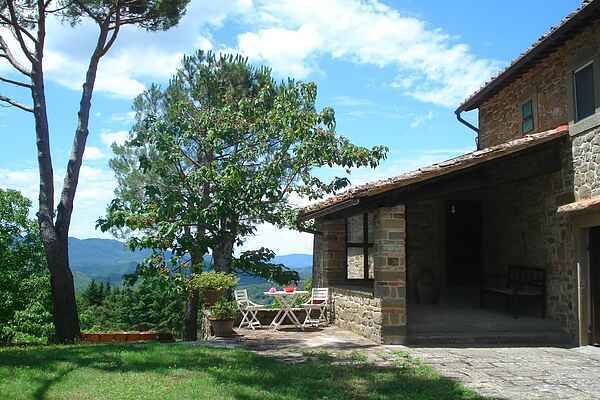 The farmhouse is located about 40 km from Florence, in a quiet and peaceful location with stunning views over the valley of Mugello. The house has a large enclosed garden surrounded by green hills. Outside there is a barbecue, a terrace for outside dining and for a real moment of relaxation. This is the destination for nature lovers who want a relaxing holiday alternated with visits to the city of art, Florence. Do take the train from Borgo San Lorenzo to Florence. You'll be within 40 minutes in the center next to the Duomo. There are lovely walks around the house for you to enjoy the Tuscan countryside. Another way to experience the area is the cycletour of 5 km along the river "La Sieve. Nearby is the famous Lake Bilancino where you can enjoy swimming, sailing, waterskiing, fishing, wind surfing or simply sunbathing on the beach. And possibly an afternoon of shopping in the famous Barberino Outlet. The house owner is a painter and is occasionally working in the adjacent part of the farm. On request there is the possibility to follow a painting course in the open air for creative guests among you!